How do you budget for your proposals? You do draw up a budget for your proposals, don’t you? Bad plan. If you don’t know how much you are spending on proposals, how can you know what it costs to write them? And how can you then roll that into your go/no-go decision? Proposals are not cheap; they can cost thousands of dollars. 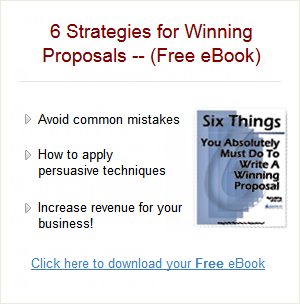 The real danger lies in the fact that proposal costs are usually hidden, buried in overhead. The proposal coordinators, graphics specialists and technical staff often do not charge to a specific job number, and their efforts can get lost in the blizzard of numbers that go along with running a business. But the dollars are real. You are going to spend actual bucks preparing a proposal, even if you don’t really see the bucks being spent. I’ve seen proposals cost anywhere from $10k to $30k or more, especially if a follow-on interview is involved. If you don’t track these dollars, you’ll never have a good measurement of how well you are doing in your proposal efforts, other than your win-loss record. And this doesn’t really tell the tale, either. With no proposal budget, it’s often easy to spend the same amount of money on a winning proposal with a small return (low value) as you would on a losing proposal with a high value. If you don’t track proposals costs–and make smart business decisions about where you ought to be spending your money–you could end up with a terrific win rate but with projects that don’t quite pay the bills. How much should you budget for a proposal? That’s a hard question to answer; it really depends on how important the project is to the firm. As a general rule proposal costs usually run between 3% and 5% of the value of the contract. But you can only discover what it takes to write proposals at your firm by scrupulously tracking the costs of each proposal you write. The amount of time it takes to write a proposal varies widely. If you are prime on a project, your time commitment is naturally going to be much higher than if you are subbing. If the proposed project is complex, then your proposal will likely require specialists from a variety of fields; this drives up the total number of hours (and thus the cost) it takes to prepare. will be spent in the first half of the effort. costs balloon toward the end of the process. When you start preparing a budget, be realistic. Imagine what it’ll really take to get the proposal out the door. Listen to your proposal coordinator when she tells you that if you wait until the last moment to get sections written, the costs will skyrocket. When your graphics expert says “That sort of graphic is going to take a lot of time, and will be very expensive” pay attention. If you still want the graphic in there, be willing to pay the price. And don’t measure everything in dollars alone. Even if your proposal staff doesn’t get paid overtime while they’re working until 2 a.m. for the fourth Sunday in a row, it’s going to cost you in the form of a high burn-out rate (look around; there aren’t a lot of proposal specialists who have been at it for ten years or more). Regardless of the type of proposal or its size or whether you’re the prime or the sub, proposal costs rise when the following conditions are in force. No page limit specified in the solicitation. No page limit given to the writers. Principals deeply involved in the writing process. No clearly defined project approach before the solicitation arrives. No project team assembled before the solicitation arrives. Lack of a proposal development schedule. Sitting on the solicitation for too long. No clearly defined-and enforced-deadlines for proposal drafts. No pre-defined limits for art developed, including the cover. Each of these are discussed in greater detail here. More than anything else, developing a realistic should be a considered a reasonable part of realistic proposal project planning. You would never run a project for a client without scoping costs. Why think you can get away with it on a proposal?